Last call! Time to pack for your much deserved vacation. And whether you're headed for a peaceful retreat in Taghazout, an intense surf excursion in Nosara or a relaxed family reunion in the Algarve, chances are a yoga mat will come in handy during your travels. Here's our selection of lightweight options for your asanas on the go. Our thoughts: Compact and resistant, this Lolë mat is an ideal travel companion. Colors: charcoal, berry and yellow. Dimensions: 24 in. x 72 in. (61 cm x 183 cm). Note: the back is slip resistant. Where? Try it during a stay at Desa Seni in Bali. 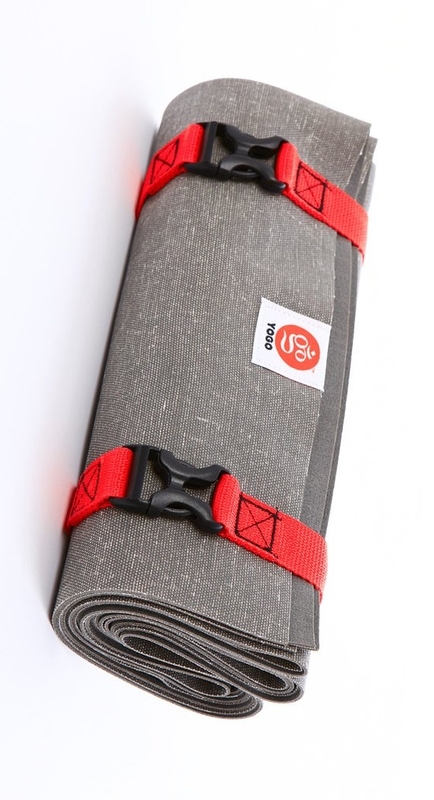 Our thoughts: the eKO® SuperLite is a portable travel yoga mat that can be easily folded to fit into small spaces. It's also Eco-friendly, biodegradable, and durable. Colors: truth blue, thrive, fuschia, tortuga, brick, arise, açai, thunder, new moon, midnight, raisin. Dimensions: 180 cm x 61 cm. Note: The surface texture offers excellent grip, even with light perspiration. Where? Try it during a stay Paradis Plage Yoga in Morocco. Our thoughts: the Yogo travel mat folding design keeps the mat clean, and you can use the attached straps to hang it to dry, when you wash it. A plus: the brand plants a tree in Africa for every mat you buy! Dimensions: 61 cm x 173cm (30cm x 1,5cm x 2,25cm when folded). Note: The mat offers a super-sticky grip even with light perspiration. Where? Try it during a stay at Rancho La Puerta in Mexico. Our thoughts: A large color range (the nile blue/seaside color is perfect for the summer). Easy to clean, durable, absorbs moisture (an antimicrobial additive helps prevent mould and mildew on the mat). Colors: dark olive/gator green, dark adobe/ruby red, hail/arctic grey/arctic grey, black, nile blue/seaside. Note: The natural rubber base gives you cushioning and grip in low-sweat classes. Where? Try it during a stay in Silver Island Yoga in Greece. Colors: lavender, purple, olive green, midnight blue. Note: The Voyager folds up to about the size of a yoga block- allowing it to fit perfectly into your suitcase or backpack. Where? Try it during an Epic Yoga Retreat in Iceland.